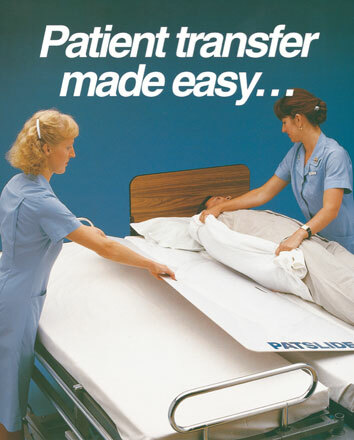 Proven in hospitals internationally over many years, PATSLIDE is widely accepted as being the ultimate in patient safety and comfort during transfer. The smooth upper surface provides low resistance, allowing for easy transfer. When the patients weight is applied, the non-skid inserts on the under surface grip firmly onto the operating table, trolley or bed. It’s easy to position, and lightweight, weighing less than five kilos. The PATSLIDE even flexes to facilitate movement of the patient. Often siderails do not retract far enough causing transfer difficulty. The PATSLIDE provides a smooth bridge, spanning the gaps that occur between beds, trolleys and tables. The PATSLIDE has no sharp edges or protrusions. Even the handles have been specifically designed, enabling any staff member to easily position and work with the PATSLIDE. The PATSLIDE is easily stored. The PATSLIDE is made from a specially formulated thermo plastic, making the PATSLIDE static insulative and X-ray translucent. The PATSLIDE is easily cleaned. With a full appreciation for the need for cleanliness, we designed the PATSLIDE so that it may be cleaned simply by washing with a detergent, or any other aqueous based disinfectant.